This is it. I am following the thread of my dreams all the way to paradise! I am taking a stand for my own creativity and for healing. It is time for a new adventure and so I am doing something that I have never done before. Many of my beautiful paintings are ready to spread their wings and fly to a new home. They will arrive with an abundance of healing energy and blessings! I am slashing prices by more than 40% and to make it even juicier, a portion of the proceeds from this sale, is going to CORAL REEF Alliance. 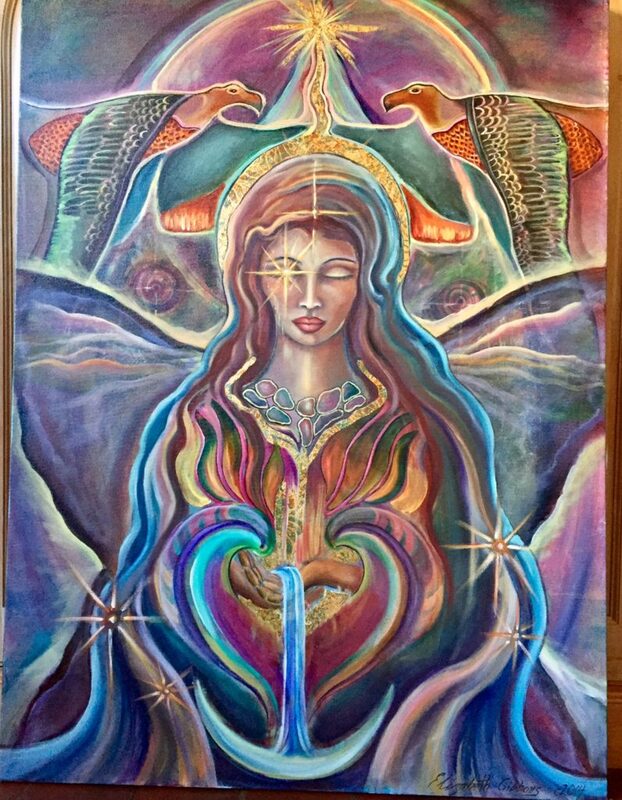 All my art is created with sacred intention and infused with the intention to heal myself and to be an energetic icon of healing for the person who feels called to bring a particular piece of art home. Part of following my dream and my heart, includes giving back to one of the beings I love most in this world, our Great Mother Ocean. Yes I think of her as a great, beautiful, powerful, generous, fluid, radiant being, a life force energy, that deserves our greatest love and care. That is why I am choosing to give back to her through this art sale. – Working with people around the world—from fishermen to government leaders, divers to scientists, Californians to Fijians—the Coral Reef Alliance protects our most valuable and threatened ecosystem. We lead holistic conservation programs that improve coral reef health and resilience and are replicated across the globe. It’s true. I am moving. Following my heart west to the island paradise of Maui. Land of enchantment, beauty and healing. We bought a new home now named “the Palace of the Palms”. When I was there in May, celebrating my 60th birthday, I FELT the miracles that blessed me in every moment. It was like a home coming. As I release, let go and discard so much “stuff” from the last 26 years, I have been reflecting upon what it takes to follow my dreams. It’s not always smooth sailing. I just came from a mastermind women’s circle and we were in deep inquiry about what it means to be “in the flow” vs. “forcing”. I also recently listened to a wonderful webinar where the conversation was about “goals” vs. “intention”. For me it is important to know my intention and have clarity about my “destination” (destination not having the meaning of a particular place but knowing where I want to be energetically in my life). I know that my intention is to live the rest of my life in resonance with my soul and to step fully into my creative power. I don’t know if that means I will be in Maui full time or not. There is an element of mystery in the divine unfolding that I want to embrace and ALLOW for. It may feel safer to follow a series of steps and to delude myself that I know all the answers to what’s next. When I do that (and I certainly have in my lifetime), I have learned that I am closing off possibilities and moving out of alignment with the co-creative force of the Universe. When I am in the “flow” it feels different. My actions are focused and yet, at the same time, I am surrendered to what wants to happen. I am still sustaining my practices of self-care. My energy is open in a different way than when I am “forcing my will” upon what is next. I am in a dance with the Universe. There is a sweet spot in between effort and surrender that I learned about from the ocean and the way that jellyfish swim. More to come on that in my next blog post. I am curious to know, what are your thoughts, feelings, intuition on what it takes to follow your dreams? I would love to hear from you. What does it feel like when you are “in the flow”? When you are not, how do you get back into alignment? Does “being in the flow” support you in creating your dreams and your dream life? Share in the comments below. If you have ever wanted to own an Elizabeth Gibbons work of art, this is your chance! I am happy to offer a GIFT of INSPIRATION payment plan custom curated to match your budget. 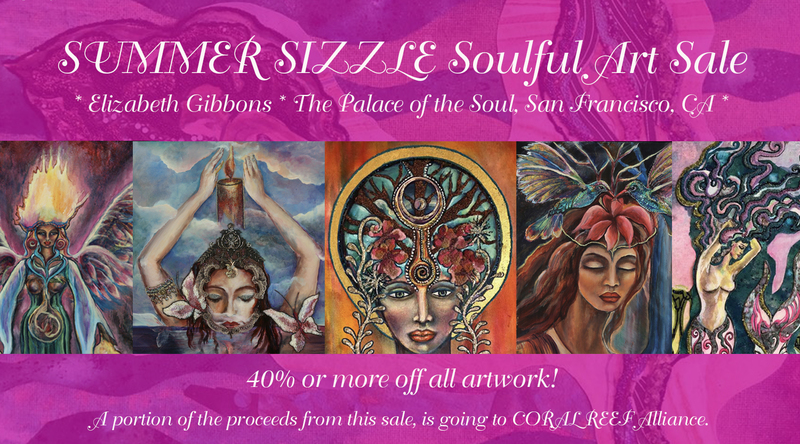 “wow, thank the Goddess for prompting me to support a fellow artist by purchasing your painting. With a few clicks, I have broken through my decades old barrier that the world doesn’t need another painter… Life is NOT a zero sum game. there IS room for my creative expression, too. Each work of art is created with sacred intention and with energy to call in the specific energy that I am guided to create for healing at this time. You can read about each piece and be supported in calling an energy shift into your life by bringing this art into your life and your environment. Flower Song is a celebration of the beauty of butterflies. 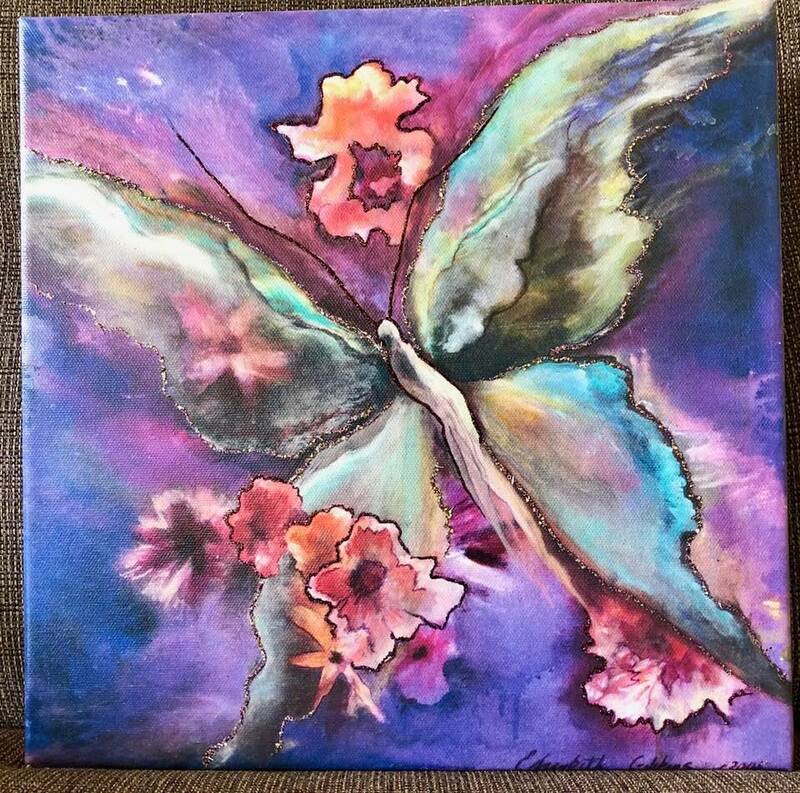 Butterflies symbolize the soul “fluttering free” and this one soars in an ecstatic flight of freedom. Connect more deeply with your soul’s ability to access freedom through communion with the beauty of nature. In this image, spring flowers blossom in harmony with the music of the soul’s freedom. This is an icon of beauty, freedom, hope and celebration. Awaken inner freedom and sustain hope even in the face of life’s challenges with this beautiful image. This painting was inspired by a magical encounter with a hummingbird in my garden in San Francisco. The hummingbird came and hovered right by my face for a miraculously long time. I experienced all over body chills and felt myself uplifted into a place of delight and joy. I felt a deep connection with the dimension of spirit and there was a shift within my soul that allowed me to open to more deeply felt love and sweetness. It was a moment of being infused with “divine honey”. 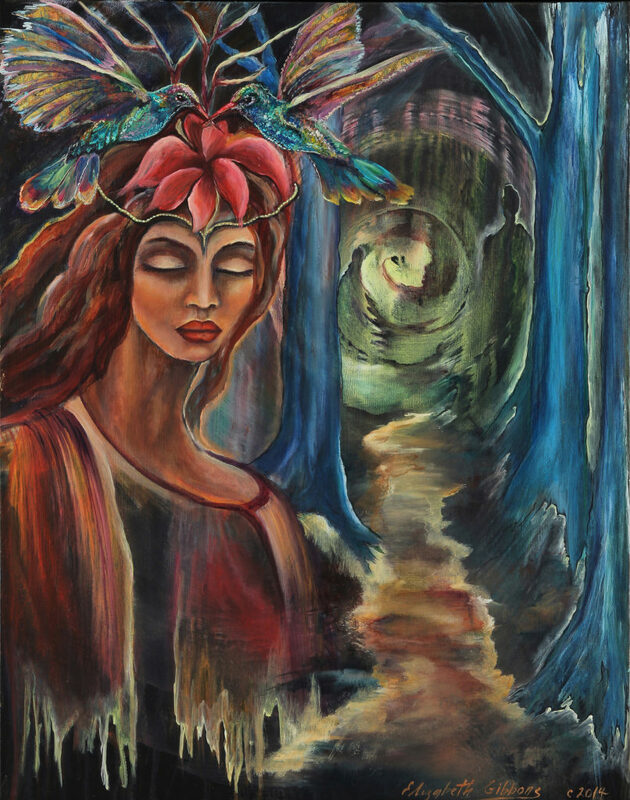 This painting will awaken your connection to the spirit world and to the energy of the the sweet lightness of being that the “hummingbird” embodies. Negativity will be easily dissolved, resilience strengthened, playfulness and joy will enter your life in new ways and you will be invited to express love more fully. This image will also awaken your ability to travel long distances tirelessly and to connect with benevolent spirit guides. Price originally $2950. Now being offered at $1700. 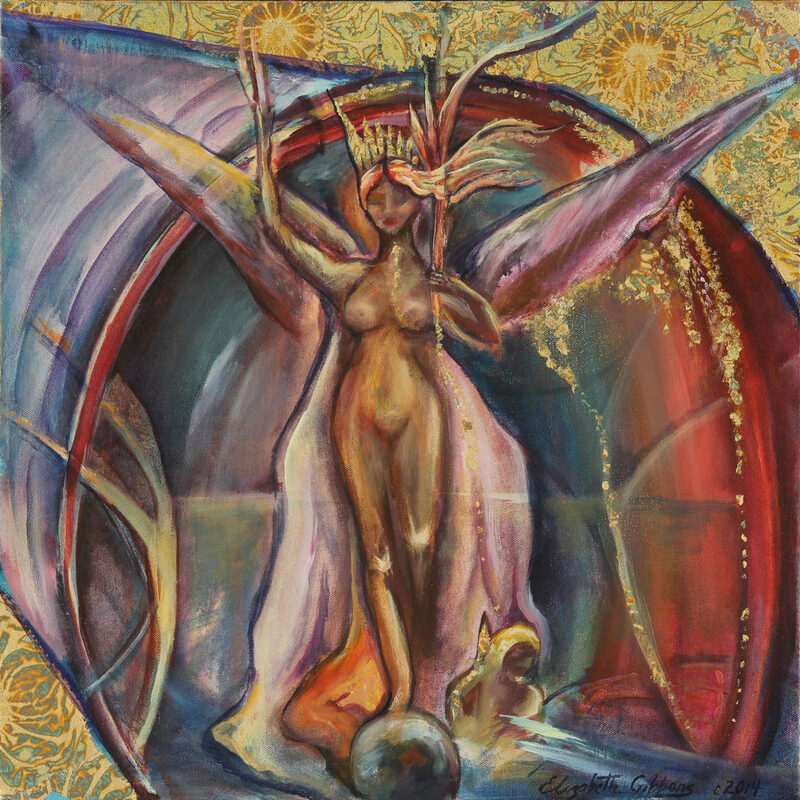 A powerful icon of transformation, strength, love and light created by visionary artist Elizabeth Gibbons, to honor all the women of the world, who choose to live their lives as “warriors of the light” and healers. She may be mother, daughter, caretaker, counselor, healer, artist, lover, business entrepreneur, housekeeper, property manager, bill payer, cowgirl, priestess, shaman and chauffer. On any given day she contributes love, light and healing to her community and to the world. She changes “hats” numerous times and occasionally there really is no time to “change” so she just wears two or three or even four all at once. She tries to take “one day at a time” but more and more it seems that the world keeps throwing a whole bunch of days at her all at once. She understands that all beings are connected and that when one suffers, we all suffer. 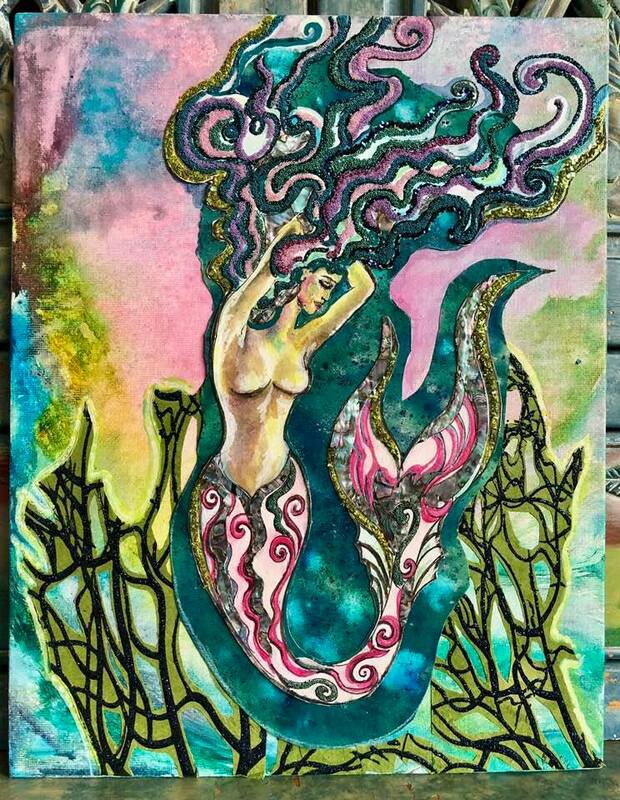 Most days she is able to embrace her role as “warrior of the light” and she loves the busy abundance of her life but occasionally she is tormented with a saturnine melancholy and then she feels afloat in an out of control sea where the water is rising. She is on the brink of drowning in the deep darkness of this mysterious ocean called life. She has no choice but to raise her arms high, holding up the light. That light is pure love, bestowed freely. And in that moment of grace the water is no longer rising. Now she is rising from the sea, proud, defiant and eternally transformed. She has found the secret to eternal life. The waters have been turned back and “death” has been conquered by the “light of love”. Note to collector; Collectors from out of state do not pay sales tax. Collectors cover shipping costs. We will package paintings ourselves to reduce shipping cost. The Muse of Peace and Protection is a powerful icon and guardian of your soul’s essence. She carried with her the energetic vibration to create peace and especially watches over relationships bringing harmonious interactions. Her crown contains the symbols of the sacred tree of life and the Divine Feminine. She is surrounded by the colors of the phoenix and thus brings the energy of renewal and resurrection. She will support you and offer great power, especially for any new endeavor that is in alignment with your soul. 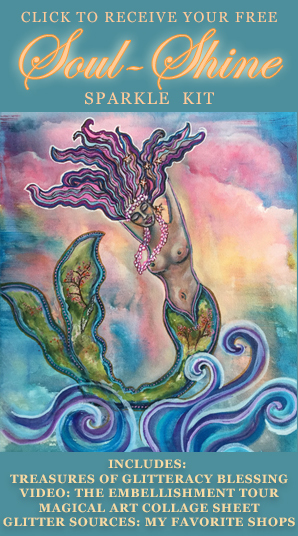 Pink Coral Fizz is a powerful Mermaid Icon bringing the energy of playfulness, full out frolic as well as serenity and the strength and healing supportive energy of coral reefs. Coral reefs support a variety of eco systems in the ocean and Pink Coral Fizz will offer a “circle of support” for your life’s dreams. Hang on above your dream altar and watch as you enter the “flow” of abundance! I will be adding more art for sale regularly so keep checking back every week!!!! Our Lady of the Royal Road to Liberty is an icon of freedom of mind, body and spirit that has been realized as a mythic journey. She has answered the call to adventure that emerged from the deepest parts of her soul. She has journeyed through the great adventure, overcome obstacles, faced challenges and ordeals as part of her initiation. Finally she has come to the completion of her journey where she is able to integrate and receive the healing from her experience. She is claiming her new life and fully embodying the newfound freedom that she has earned. She is in a state of ARRIVAL. 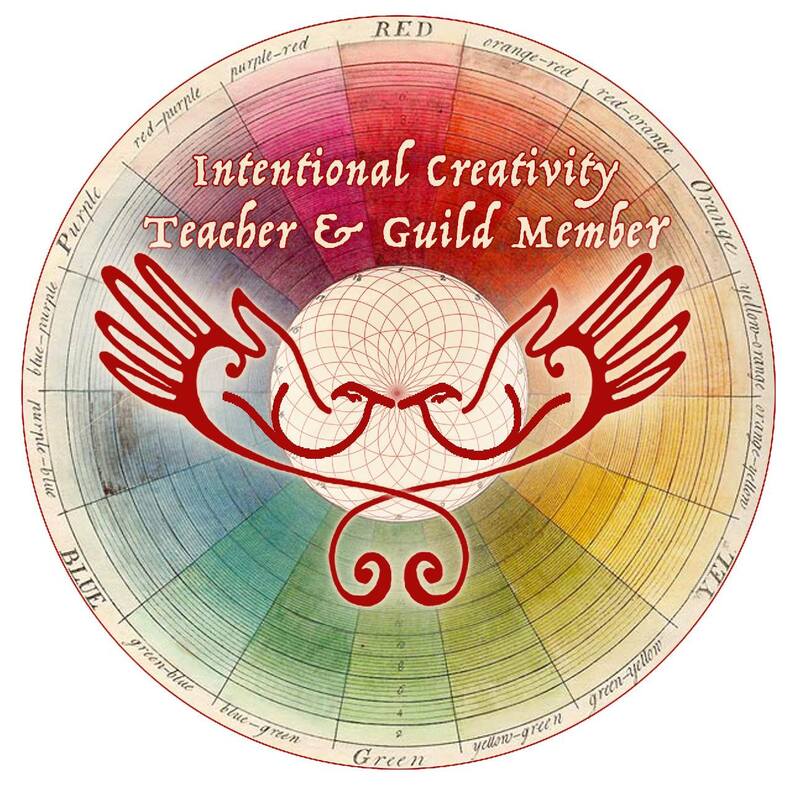 This icon will support you on your “mythic journey” as you move towards greater healing, creative self-expression and integration of mind, body and spirit. It will help you to receive support both from the material realm and the etheric, angelic realm. An Icon of deep healing and transformation. Her wounds are released and transformed into the outpouring of compassion from the Cosmic Heart. Above her head, symbols of the animal ally, the vultures protect in the symbolic region of the future. This is a reminder to release all that no longer serves in each moment. Peaceful and powerful, this image will support you in any journey of deep healing and transformation. 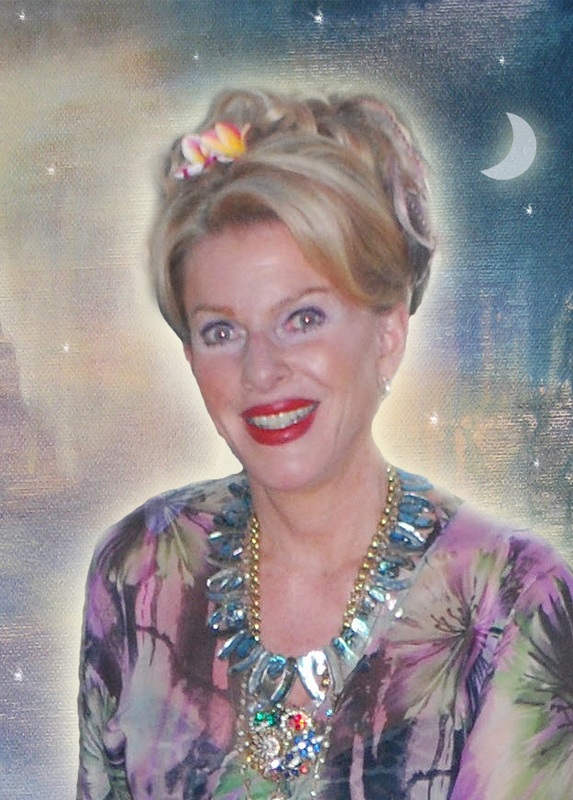 She is especially charged to support you in releasing energy from past traumas and wounds that may have gotten stuck in your field. An icon that will awaken the power of your creative life force energy and your ability to link your creativity to your intuition. 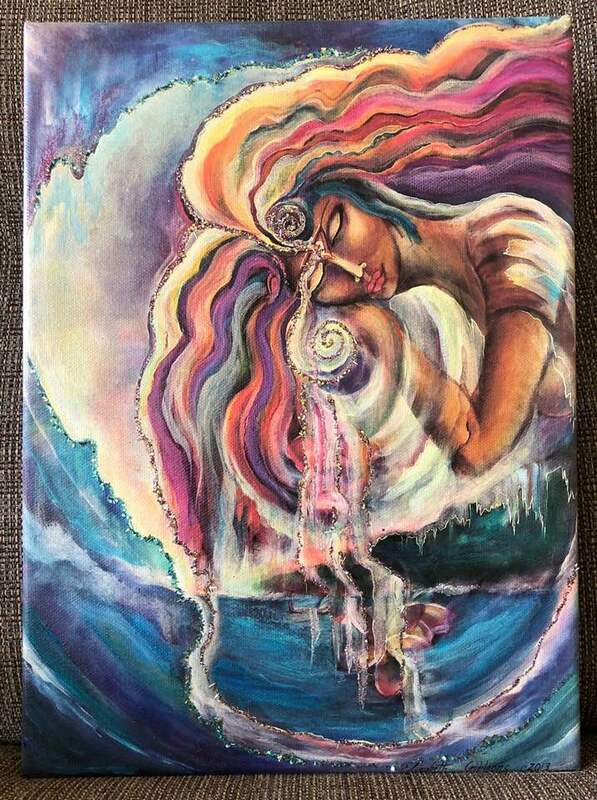 She Who Birthed Rivers of Life is a chakra painting that will awaken your third eye chakra. 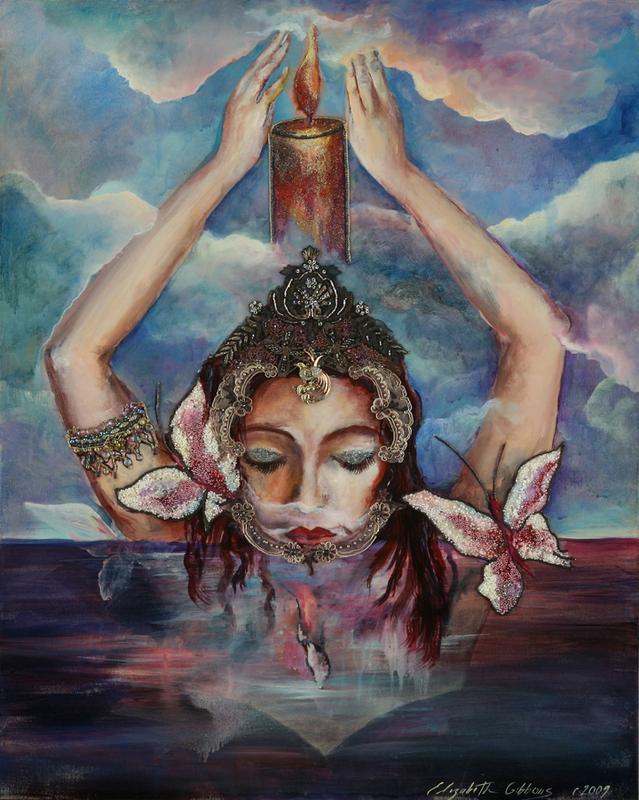 She is the “Muse of Vision”, from her third eye chakra flow rivers of light that are the essence of her being. These rivers of light give birth to the ocean and the land. What she visions she then creates in form. She emerges from the sacred land of “Hawaii”, the place of heaven upon earth, where spirit and form become one in a divine union. 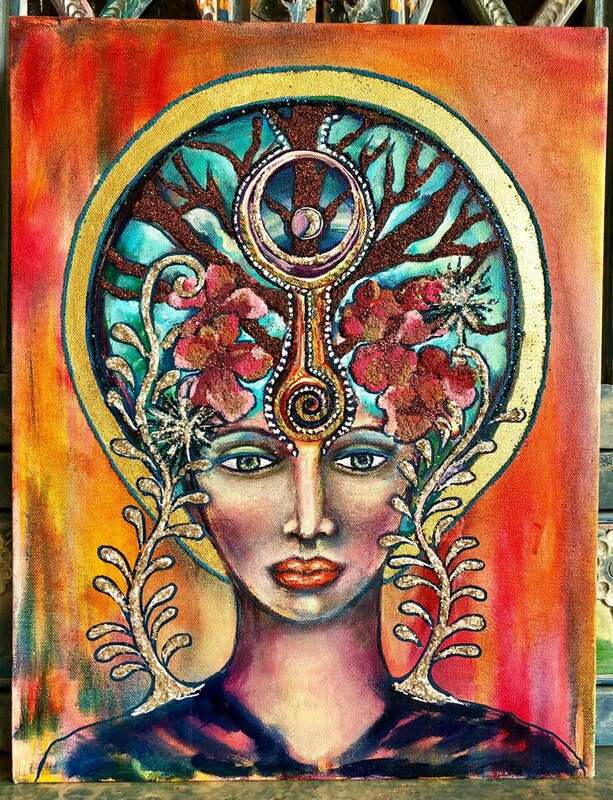 She expresses the language of the Visionary Artist, who can spread the seeds of creation with the awakening of her intuition. The visionary has the gift of being able to “see” all possible futures and she sparks the expression of limitless consciousness, illuminating all possibilities with these rivers of light that stream forth. Her prayers drip into the sea life spreading healing to the waters and land of Mother Earth. 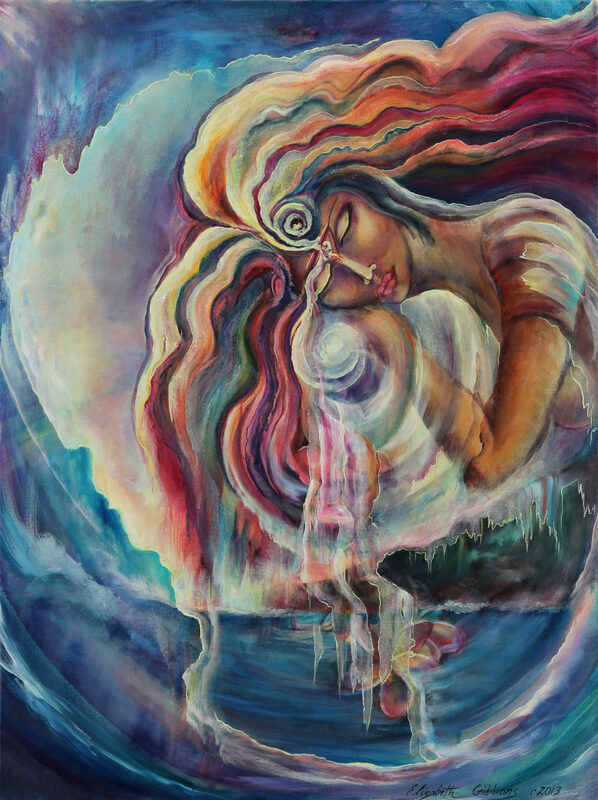 This painting will support you in connecting spirit to matter and bringing forth healing for yourself and others through your creative self-expression.